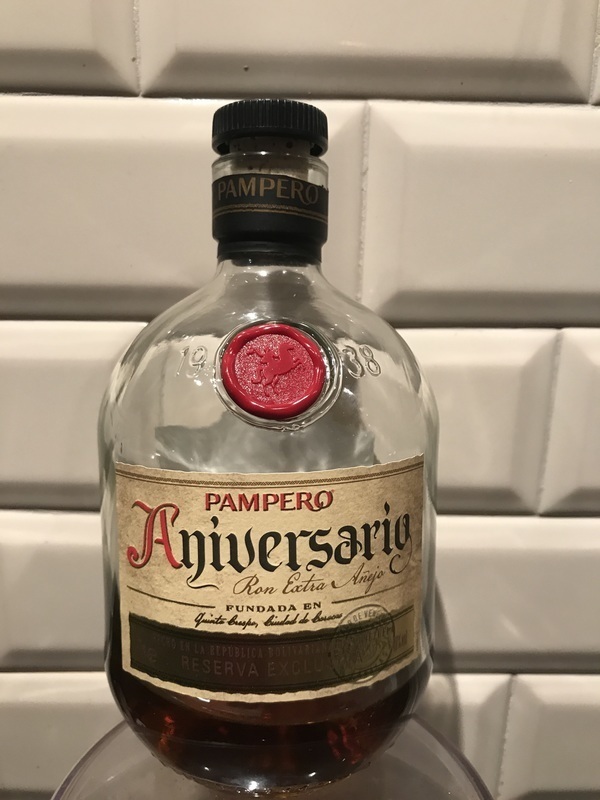 Have you found an online vendor selling Pampero Aniversario Reserva Exclusiva? Has a lot of wow factor as a gift due to the leather sack. Very smooth, so watch how much ice you use. Oaky vanilla flavour is really nice. This looks great with the leather presentation pouch. The first scent is sweet caramel (sticky toffee pudding!) but was a bit harsh. This soon mellowed and a drop of ice helps. Great for sipping. A touch expensive to use as a mixer but tastes good either way. This rum has a nice smell to it. Brown sugar, oak, spice, and tobacco. Taste is similar, but to me it's a bit harsh for a 40%abv rum. It's a fairly decent rum, but I prefer a little more sweetness such as found in other Venezuelan rums like the Santa Teresa 1796 and the Diplomatico Reserva. Gelungene Aufmachung, die Kugelflasche im Lederbeutel. scharf, guter Körper, Ausklang ok.
Ein durchaus gut gemachter Rum für alle Tage. Successful presentation, the ball like bottle in the leather bag. Sharp, good body, finish ok.
A very well done rum for all days. Like many, the packaging caught my eye first. Ended up pouring some [after I got home] into a small snifter and, as it happens, got called away for more than half an hour. Here's the interesting part... having a sip after that period of time, I found that the breathing/aeration helped change the flavor profile, and improved smoothness a lot. A full-bodied rum, with "great legs" on the snifter glass. So my initial tasting would have resulted in a 6/10. This one made me raise the rating to a high 8 - hence the nine. Bottom line: Whether trying it for the first time or revisiting it, pour it into a snifter and give it time to breath - your patience should be well rewarded. I like this rum, smooth, medium-bodied, great for sipping. I commend the brand for its use of a leather sack, a unique and premium-looking packaging. My go to rum. It's in short supply right now and I found two bottles this weekend at a store about 45 minutes from home so I'm good for a while. That said I'm thinking of driving another couple of hours up the road to get another bottle or two. It's that good! Smooth tasting, not to sweet or spicy. I call it a grownup rum. If you can get your hands on a bottle do it. More bite than expected, but decent stuff. You're first greeted by a sharp alcohol smell, then a sweet aroma, and a large amount of oak. In the end, a great package for an OK rum. Who gives a horse's petootie about a leather pouch, what a bunch of rarified dandies! I toss it. I'm in it for the booze, and what dark and lovely stuff it is. All the classic rum flavors are there, but then something dark and almost bitter or tarry -- like 90% dark chocolate or Italian espresso -- comes in, and it almost tips into nasty, but doesn't, it walks the line, and pulls it out. I find it very smooth, neat or rocks. I buy this and tuck it away whenever I see it, I even love the squat little bottle. It's like an old reliable friend. Grab it and run off under a tree and tipple it like a crazy old coot while humming a sea chanty. I have a buddy that really loves his Rum n' Cokes - I pull this one out and serve with Q Kola over ice, and its unbeatable. Rich, compelling, and delicious - working in synergism with the cola rather than just being a spiked soda. A sipping rum by nature, with oodles of complexity, even PX sherry notes. Over ice, with a cigar, or in an old fashioned is preferred. Is really amazing with cola (go with cane sugar cola, like Coca Cola from mexico, Pepsi 1893, or Q Kola). The leather bag it comes in looks great on the shelf. The contents are ok. Initial taste was strong with coffee and sweet notes. Some ice to mellow is pretty key here. It's fine. Not one that I'll be in. Rush to buy again, but perfectly serviceable. That shelf look though. Color is on the darker side of tea. Smells... well it's hard to place my finger on that. Crazy as it may sound, somewhere between dried fruit zest with woody over tones. As for flavor, sweet to start with but soon turns peppery and spicy. For me there seams to be no real balance and am therefore disappointed with the cost point-experience factor. Dark bronze or leather color, with aroma of vanilla, caramel, brown sugar and toffee. On the palate vanilla is present with woody notes. Soft and round the leather arrives on a medium finish with the alcohol that remains present but without taking the top. Nice packaging. kann nicht verstehen, warum er hier von einigen als "nicht so Süß" beschrieben wird. Meiner Meinung nach ähnlich dem Diplomatico sehr süß, dennoch gefällig mit viel Aroma. Kann pur getrunken werden, macht sich aber hervorragend als Basis für einen Cuba Libre. Good, then not, then good again. Havana Club flavours with a sour punch. Happy to drink but can't see myself choosing it from the shelf with excitement. This rum has a nice "edge". Not so sweet. But still very good sipping rum. Love the leather sack! This rum has been sitting in my collection for about a year... I recall that it had a very strong bite, so I was not in a hurry to re-visit. That said, it was actually OK. It is nearly odourless, and has a dark brown colour, with a tinge of red. While it did burn the throat a little, it actually wasn't too harsh. It was a little sweet, but not too complex - I didn't really taste much of anything. I don't really expect much from a "tweener" rum (Aged > 4 but <10 years), but the leather sack it's in, makes you anticipate more. Nose: Pleasingly coy nose on this one at introduction. Smells a little too sweet and one dimensional to be refined and makes me think it is quiet young with the ambition to seem older than it is. Like a teenage boy with grandads perfume on. Kind of oily and thick which can be promising but the lack of edge raises a red flag for me. Then comes the compulsory butter scotch and caramel, some dried fruits, hazel and walnuts. Detect also margarine (that´s a first) and vanilla coke. It also reminds me of Versace Edt Pour Homme but I suspect I´ve bumped into someone with that fragrance on earlier today. It develops somewhat in the glass and after a while I love the smell. Nougat, some citrus like orange marmalade and grape fruit zest. Very nice, could smell this all night! Mouth: Yes, very sweet. Oh, and it comes in waves. First a small swell of cool sweetness with some exotic fruits, then a slightly larger swell carrying dried fruits and nougat and finishes with a monster wave of embrowned butter and burnt sugar, molasses even. This is the fault in my humble opinion. It is very mellow throughout the whole palate and is evenly presented with its entire register of flavors. In that respect it is very well balanced. I like each and every element but it is just too sweet and sugary which in the long run is …boring. Taste good though. Reaction: As usual I don´t have a clue of what I am drinking. Apart from the treacle-like sweetness it is rather gentle and cool which is an unusual but welcome feature. It is also anonymous and lack that individuality I do appreciate so much in 40%-ABV-and-above-spirits. After 30 minutes I don´t agree with myself about the age statement anymore. I feels older and more self-confident towards the end but it seem to have lost interest in itself. Like an I-am-what-I-am-attitude. Good stuff but a tad sweet and simple. Seems like a bargain taking the price into account, but again, when do I drink it? Good reviews here a some good references from my friends made me to buy this rum. But it was big disappointment. It bites in the nose, bites on the tongue and bites in the throat. Maybe it is just bad bottle, ti would not be my first experience that one bottle tastes different than another. But for now i am not recommanding this rum. Retasted: rate 4->5, but still unsatisfiing experience. This rum is not good, taste is just flat and bity.